One of the largest castles in Poland, the Ksiaz Castle is located within the Ksiaz Landscape Park in Walbrzych, Poland. Due to its gorgeous natural surroundings, its architectural significance, and its role in Polish history, the Ksiaz Castle and its grounds hold something for every visitor. Built some time between 1288 and 1292, the Castle was used by Bolko I, Prince of Swidnica and Jawor, as a fortress; nevertheless, it was noted even then for its location amidst the beautiful forestry of southwestern Poland. Throughout its long and fabled history, the Ksiaz Castle was owned by Czech kings, Hungarian rulers, and even the Nazi regime for a time, before falling into the hands of the Walbrzych district government. Its various owners expanded the Castle into the sprawling monument that it is today. The extensions, outbuildings, mausoleums, and secret tunnels that have been added to the existing fortress show history’s effects on the Castle Ksiaz, making a walk around the grounds feel like a journey through time. The Ksiaz Castle itself serves as the main attraction on its grounds and can best be explored through the various tour routes offered. 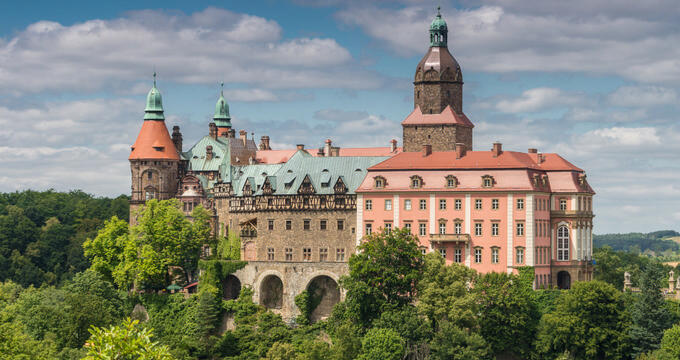 Route 1: This route is referred to as “Baroque Ksiaz.” Taking visitors through the most eye-catching parts of the castle, this tour is a great place to start for new visitors. Combining the history of the building and its residents, this tour explores the Green Salon, the Maximilian Hall, the White Salon, the Chinese Salon, and the Baroque Salon, all of which are designed in the Baroque style. The tour ends at “Fortune’s Rock,” which leads onto the castle’s terraces. The tour lasts 40 minutes. It is available to organized groups and can be booked online or by phone. Route 2: The second route, “From the Piast Dynasty to the Mysteries of the Second World War,” digs deeper into the historical aspects of the Castle. Talking visitors through the rich and varied past of the Castle, guides will first lead guests through the most notably beautiful of the Castle’s rooms. The tour then veers into areas of the Castle that were renovated by the Nazis, as well as through the oldest areas of the Castle. Visitors end their trip by passing through a cramped underground tunnel dug during World War II. For those looking to experience history up close, this is the tour to take while at the Castle Ksiaz. This route takes 90 minutes to complete. It is available to individual visitors and organized groups. Visitors can also expect to see the Castle’s permanent exhibit, The Castle’s Hidden Secrets. Located on the third floor of the Castle, this attraction features newly discovered photographs of the Castle as seen throughout history. Tickets to visit the Castle and these exhibits may be purchased online. The Ksiaz Castle offers a variety of special learning opportunities to their youth visitors. The Classes at the Castle program is available everyday from 8 a.m. to 4 p.m., providing students with the chance to learn about history and architecture. Comprised of two modules, students and teachers first learn about the history of the Castle and its residents through a presentation and the use of archival photography. Next, students tour the castle to further understand the stories that they were told. Groups can contain no more than 50 people. Reservations can be made by phone or email. For a more whimsical trip, students can also journey down The Ksiaz Fairy Tale Route. Meant especially for elementary school groups, this tour explores the fairytales and legends associated with Ksiaz. Surrounded by tales of dragons, heroes, and concealed animal helpers, they will have the opportunity to take in the lavish rooms around them while also developing their imaginations. Groups cannot exceed 15 people and reservations must be made by phone. The Castle Ksiaz has much to offer visitors looking for a unique experience. Haunted Ksiaz: An Evening Adventure- Appeals to the thrill-seekers out there. Available every few months on Fridays and Saturdays, visitors pass through the Castle’s halls with only a guide and the light of a lantern. Obscure and terrifying stories about the Castle’s history will intensify the experience. On special dates, such as Valentine’s Day or Friday the 13th, guests can expect special versions of this tour. English-speaking guests should note that individual tours occur only in Polish, but group tours can be booked in Polish, English, German, Russian and Czech. The Castle warns that the faint of heart and those with children may want to limit their visits to the daytime, but those looking for a scare will be in the right place. Reservations can be booked by phone or email. The Castle Ksiaz also continually offers a selection of special events that use the Castle’s grounds to explore some aspect of culture, history, or art. An up-to-date calendar of events can be found on the Castle’s website. Visitors to the castle will appreciate the two restaurants conveniently located near Castle Ksiaz. Ksiazeca Restauracja and Restauracja Bramaserve fresh, traditional Polish food amidst the lush greenery of the castle grounds. A gift shop is also available for those looking for a souvenir from their stay at the Castle.